Equipment on this page is available for faculty to checkout. Please use the AV Equipment Reservation Form to make a request. Please submit your request at least 2 business days in advance. Used to poll students/audience for their responses to PowerPoint questions. Results are instantly summarized on the screen as a graph. Instructors can checkout up to 50 per class. Features USB connectivity and SD card storage. Please note in your request if you want the audio processed by an A/V Technician or if you would like to handle it yourself. Unless this is used for a speech class, please enter this request as a “Pickup”. Instructors are expected to pick up the digital camcorder. Tripods are also available. Please note in your request if you want the video processed by instructional media or if you would like to handle it yourself. Please enter this request as a “Pickup”. Instructors are expected to pick up the digital camcorder from HW220. Tripods are also available. Please note in your request if you want the images processed by an AV Technician or if you would like to handle it yourself. For displaying books, documents, or experiments onto a larger display or for recording to a PC. Features VGA (PC), USB, and Composite (TV) connections. 40" Television, DVD/VHS combo player, and desktop PC. A USB headphone and microphone for connecting to a PC. Please enter this request as a “Pickup”. Instructors are expected to pick up the headset from HW220. 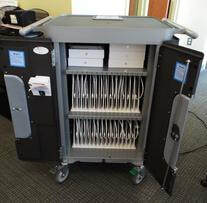 Mobile iPad cart is available upon request for special events. Instructors must receive special training before requesting the iPad cart. Contains various educational and productivity apps. Instructor/faculty use only. 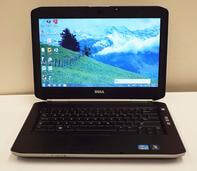 Individual laptops are available for instructors and faculty. They come with a power adapter and laptop bag. Please enter this request as a “Pickup”. Instructors picking up AV items should come to HW220 or call x-4819 for more information. High output loud speaker for playing audio from various sources to a large crowd. Available for large events such as those that take place on the Quad, ST Galleria, or large rooms with no speakers. MP3 player connections and wireless microphone available upon request. For student collaboration, faculty sharing of content, mobile signage. For portable image projection. Features HDMI, VGA (PC), and Composite (TV) video connections. Typically used for rooms without a projector or events that take place indoors but outside of classrooms. Please specify if a projector screen is desired. Suitable in low to medium lighting conditions. 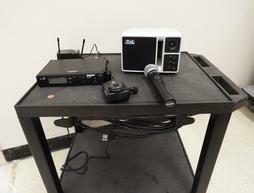 Speaker and wireless microphone on a cart for projecting audio in classrooms and for small events. Used for wireless control of PowerPoint presentations. 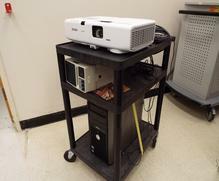 Comes with a projector and desktop PC on a cart. USB Digital Audio Microphone with 360° audio pickup often used for web conferencing or for recording multiple speakers in one room. Includes speakers, CD changer, AM/FM radio, and MP3 player input. Please note in your request if you want a stereo cart with a tape deck included. USB webcam for web conferencing. Please enter this request as a “Pickup”. Instructors are expected to pick up the webcam from HW220. For web conference assistance please contact our Media Production Manager at x4080. Please consult with an A/V Technician if you will be requesting more than 4 microphones.